SP-Arte may be best known as Brazil's leading art fair, but it also provides a platform for young designers. Contributor Benoit Loiseau selects his highlights of the ones to watch at this year's event. Every April, the international art world flocks to São Paulo for SP-Arte. But at this year's festival, which takes place from 11 to 15 April at the city's the Bienal Pavilion, a number of emerging Brazilian designers and studios presented new collections. When she created the Lixo series, which translates to "garbage" in Portuguese, São Paulo-based designer Bianca Barbato considered the lack of recycling policies in the Brazilian capital. 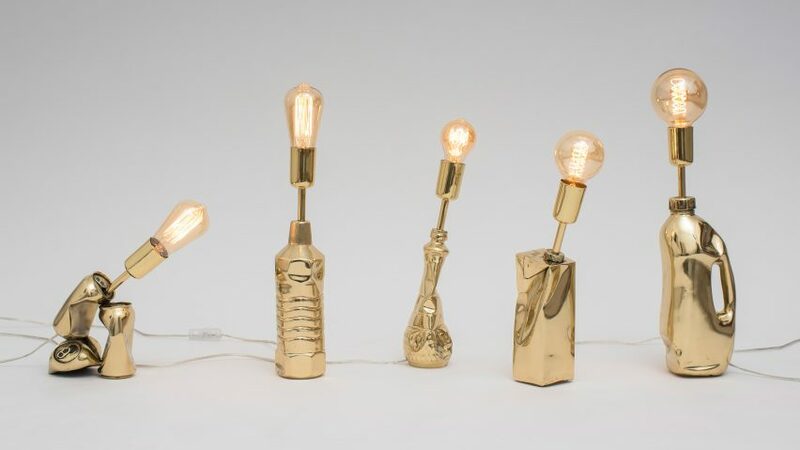 Her response is a set of five, limited-edition playful table lamps, cast in brass from moulds made using discarded plastic bottles and cartons. Founded in 2014, RAIN is a São Paulo-based design duo comprising architect Ricardo Innecco and product designer Mariana Ramos. At SP-Arte, they presented a number of recent design objects and sculptures, but the highlight was their Swimming Pool tables. As the name suggests, the curved coffee tables are shaped like a swimming pool, designed to evoke a sense of nostalgia and leisure. They are made in powder coated-steel with a painted glass top, and the miniature ladder can be placed in different positions. Humberto da Mata is probably best known for his extravagant stools and benches, but the young Brazilian designer and architect presented a ceramics collection at this year's edition of SP-Arte. Titled Morphus, the series of six, hand-made vases explores the possibilities of lathe technique combined with different types of patterned glazes. Based in Belo Horizonte, Alva Design was founded four years ago by artist Susana Bastos and architect Marcelo Alvarenga. For this collection of stools, the duo expanded their existing Bench Gui series, producing new pieces in four different sizes. The wooden frames are built from jequitiba — a popular wood in Central and South America, also known as "royal mahogany" — while the seats are made of leather, suede and plastic. Noemi Saga's Nuno Lamp merges Japanese design techniques with Brazilian materials. Influenced both by Japanese origami and Brazil's legacy of brutalist architecture, this 80-centimetre-long pine lamp is finished using a treatment inspired by Shou Sugi Ban — an ancient Japanese technique that involves charring a wood surface to render it a deep charcoal-black.